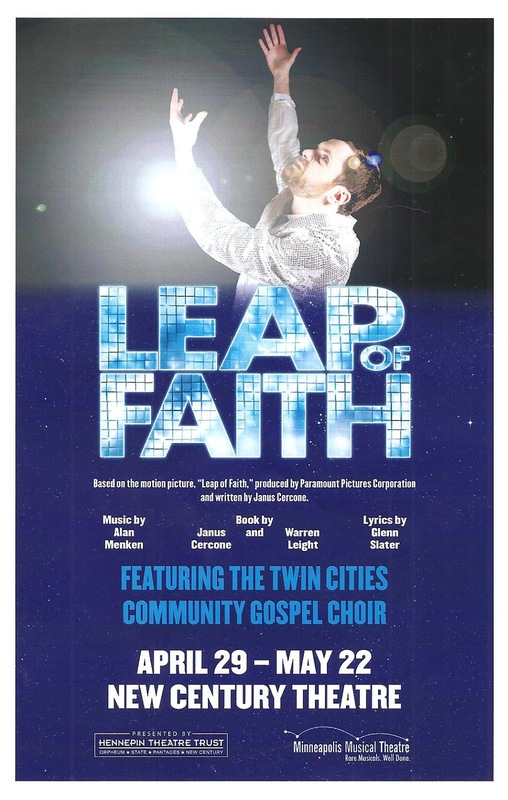 I really thought it would be raining when I left New Century Theatre last night, such is the power of Minneapolis Musical Theatre's Leap of Faith. If it were possible to bring the rain through the sheer energy of talented performers in a musical, downtown Minneapolis would be flooded every night! This musical adaptation of the 1992 Steve Martin movie flopped on Broadway in 2012, closing after less than a month. But perhaps it's better suited to more intimate theaters like the New Century, which, with curtains dropped on three sides, really feels like you're inside a revival tent. Yes, this mix of The Rainmaker and The Music Man is filled with cliches and nothing we haven't seen before, but the music is catchy and fun, and this cast delivers it with boundless energy that makes you want to rise up and be healed! Jonas Nightingale is a lovable con man like Professor Harold Hill, except that instead of selling the idea of a big band, he sells miracles. And like Hill, he can't really deliver on what he's selling, but skips town before the townspeople realize they're being swindled. When Jonas and his crew find themselves stranded in a small Midwest town suffering from a drought, he promises to make it rain. The town Sheriff Marla is the Marion the Librarian in this story, skeptical and disbelieving, seeing Jonas for the con man he is. But like Marion, Marla begins to soften towards Jonas when she sees how he's bringing hope to her son Jake, who's been in a wheelchair for three years since the car accident that killed his father. In the end Jonas is changed by the people he meets in this town, and "gets his foot caught in the door" on the way out. After selling false faith for years, Jonas finally finds faith - in himself and the people around him. As I mentioned, the New Century is completely transformed into a revival tent by Darren Hensel's scenic design. The stage has been built out to a square thrust, with seating on three sides. The stage is empty except for the awesome 6-piece band taking up residence at the back. Alternating blue and white draped panels line the back of the stage and are dropped on the sides shortly after the show starts, making us feel like we're all in this enclosed space together. Director Sara Pillatzki-Warzeha keeps the action moving all around the space, including through the aisles. The choreography is so fun and energetic that halfway through the show I wondered, who choreographed this, it's really fantastic! I was surprised to see that the choreographer is Emily Madigan in her debut as a professional choreographer. But I shouldn't have been because she's one of my favorite dancers in the local musical theater world. And the choreography is made even better by this large and talented ensemble, who really throw their hearts and souls into it. There is some serious vocal power on this stage, including Sonya Nolen-Moon, a perfect fit as Ida, lead singer in the gospel chorus. And the apple doesn't fall far from the tree - Brandon A. Jackson and Brianna Graham as her children, the skeptical Isaiah and the supportive Ornella, respectively, are equally fantastic. Speaking of vocal power, Jill Iverson just gets better every time I see her. Her voice shines as Jonas' pragmatical sister Sam, while providing a nice counterpoint for him. Also great is Emily Jansen as Sheriff Marla, and the two frenemies share a nice duet. Last but not least, Matt Tatone works as hard as Jonas to get us to believe, and it works! He's the center of this terrific ensemble (which also includes a half dozen members of the Twin Cities Community Gospel Choir) who work, play, sing, and dance well together. 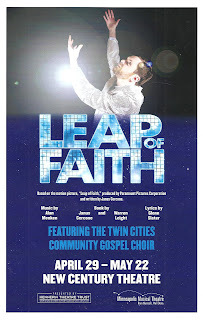 Leap of Faith continues through May 22. Check it out for a fun and high energy show. And bring an umbrella, because this crew just might actually make it rain one night, if you believe hard enough.